The use of e-filing in Delaware Courts continues to grow. As a part of the new COTS integrated case management system project, e-filing became available through the “eFlex” system in the Justice of the Peace Court through a pilot project involving a limited number of filers in July 2007. The e-filing initiative was gradually expanded to all of the civil Justice of the Peace Courts and made mandatory for certain filers. On November 1, 2008, e-filing was made mandatory for all attorneys filing in the Justice of the Peace Court and as of December 1, 2008 e-filing was also required for certain other multiple filers and for State agencies. Concurrently with the COTS project implementation, e-filing was implemented in the Sussex County Court of Common Pleas in June 2008, and was expanded to New Castle County and Kent County Court of Common Pleas on November 3, 2008. Filing fees can be paid on eFlex, either by setting up a Court Debit Account from which fees can be deducted or by using a credit card. Carole Kirshner, Court of Common Pleas Court Administrator, spoke of the significant benefits that have resulted from the availability of e-filing in that Court. She said: “The Court of Common Pleas has seen that a large proportion of its civil cases (approximately 90%) are being e-filed since the implementation of COTS and the e-filing system, which supports the Court’s efforts to process cases as quickly and efficiently as possible.” According to Frank Mroz, an Application Support Project Leader with the Judicial Information Center, “Attorneys and paralegals using the system seem pleased to be able to e-file and have commented on the eFlex system’s ease of use and low cost.” To support filers using eFlex, the Judicial Information Center has dedicated a new e-Filing Help-Desk phone number with calls being answered by Core Team staff trained on the eFlex system. All new eFlex users are required to attend training sessions. Information on the sessions is available on the Court of Common Pleas and Justice of the Peace Court websites. Delaware Courts have a long legacy of leadership in e-filing starting with the Superior Court’s Complex Litigation Automated Docket (CLAD) system which was the first electronic docketing and filing system in the nation when it was introduced in 1991. In 2003, the existing CLAD cases were converted to the LexisNexis File & Serve e-filing system, and since that time, the system has expanded to additional categories of civil cases. In 2003, the Court of Chancery became the first statewide court in the country to adopt e-filing for its entire civil docket while the Delaware Supreme Court became the first appellate court in the nation to use e-filing when it began its first implementation phase in 2005. With the implementation of its final phase of e-filing in December 2006, the Supreme Court became the first appellate court in the nation to require all appeals to be filed electronically using the LexisNexis File & Serve system. There have been numerous benefits to e-filing both for the Delaware Courts and their users. E-filing has reduced dependency on paper documents and enhanced case processing efficiencies, saving time and money for the public, litigants, and the courts. 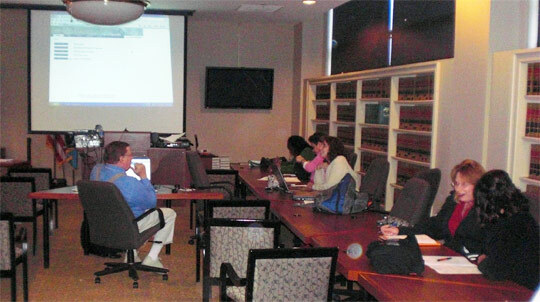 E-filing training session at the New Castle County Courthouse with David Taffet, a member of the COTS Training Team. Class was taught by Michael Von Reider of the Judicial Information Center (not pictured).